The boy has no real home, not anymore. Orbiting around the lives of those for whom he feels his existence is now, in one way or another, a complication, his time is spent comparing what he endures with the lot of those whose circumstances appear to have been far worse than his own. It’s a way to get by in this transient life, when you’re viewed more as an attachment, a burden, a nuisance, a pet, than as someone worth knowing. “At least we’re not them,” we tell ourselves, all the while knowing we probably wouldn’t spend so much time thinking about it unless some of their pain resonated with our own. Lasse Hallström’s “My Life as a Dog” knows what it’s like to feel forgotten about and left to drift towards some unknown oblivion. Like so many of the stories that flow through his mind, the film’s protagonist, Ingemar, is a boy whose happiness and well-being has become an after-thought. Seemingly unwanted, he lives on the outskirts of life, confined to adjunct spaces, with the rest of the world now existing behind shut doors or in memories of better times with his mother. 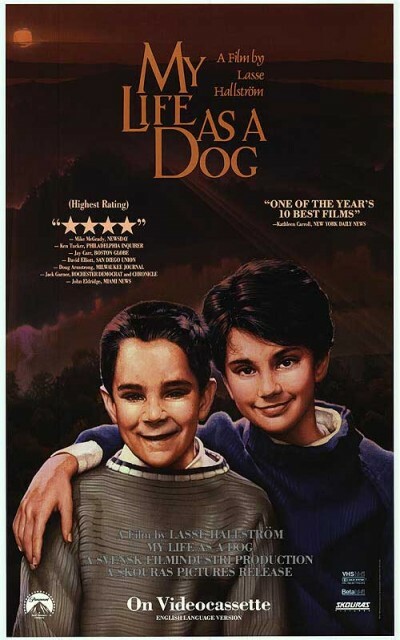 Like Laika, the first dog in space whose fate is ruminated over throughout the film, Ingemar’s idea of his future appears isolated, grim, and hopeless. To portray this notion of Ingemar being removed from the rest of the world, Hallström places the boy in a series of confined spaces throughout the film. From a drainage tunnel under train tracks, to the cabinet he hides under when his Mother is taken away, to the small spaceship-shaped “funhouse” he hides away in, Ingemar is put in places where he won’t be in the way. Unaware of the complexities of life taking place around him and confused about the changes happening within his own body, Ingemar is frequently trapped within his thoughts, unable to explain or understand what he is feeling. These pockets of solitude, then, become a representation of the darkness—the naiveté—that he must emerge from if he is to find his place in the world. These allusions to space and rebirth also play a more obvious role in the two attempts Ingemar and his friends make to jettison a makeshift “spacecraft” they find in the old barn. Their first attempt, made when Ingemar is still stuck and holding back from embracing his new surroundings, comes to a halt in mid-air, literally leaving its crew hanging. The second attempt, coming at the end of the film—following a climactic breaking down of the fun house door and Ingemar’s subsequent exorcism of grief and guilt—successfully flies but, even more importantly, comes crashing back down to earth and into a puddle of cow manure. Now knowing he is no longer destined to float away into the ether, Ingemar learns that living an engaged life often means dealing with the crap you’re bound to find yourself in from time to time.